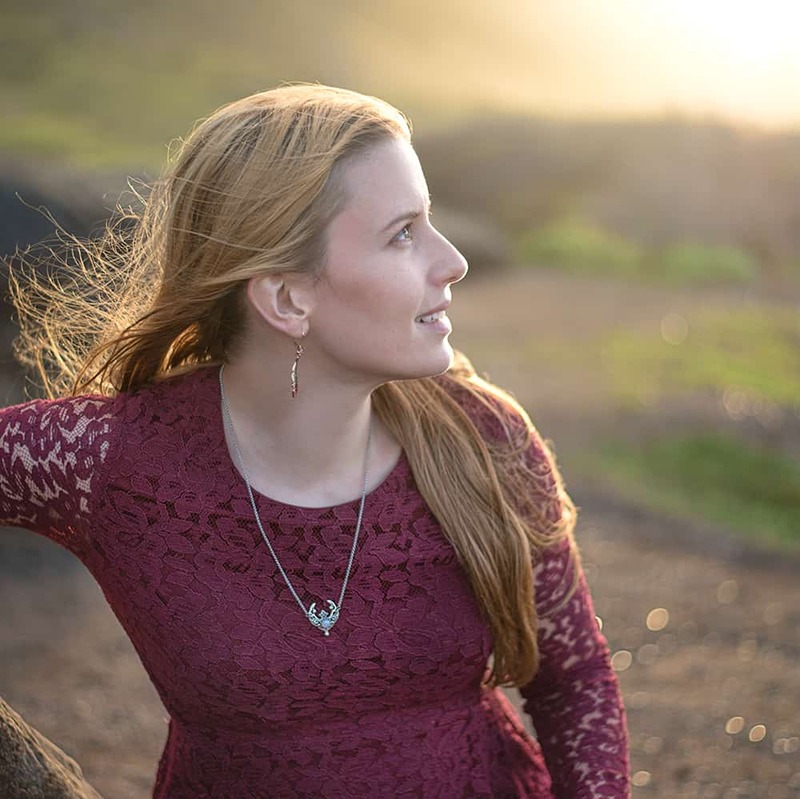 It doesn’t really feel like it winter in Hawaii, but it’s December and holiday decorations have been popping up in neighbor’s windows all week. Amusingly, one neighbor always hangs lighted icicles! 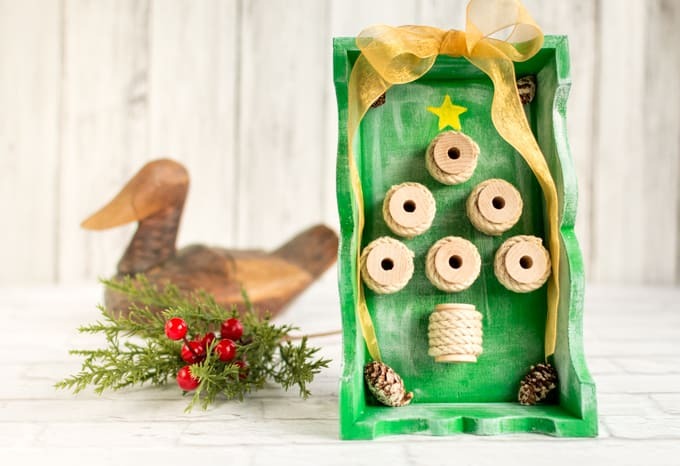 Our Christmas decorations seem to downsize each year: our first Christmas in this apartment we had a full, real tree; our second year we had a painted paper tree; and this year all we have so far is this rustic thread spool tree in a shadow box! This small thread spool tree probably won’t ultimately end up our only holiday decoration, but it has the advantage of not dropping needles in our un-airconditioned apartment! It’s also pretty cute and easy to make, so that sounds like a win-win to me. 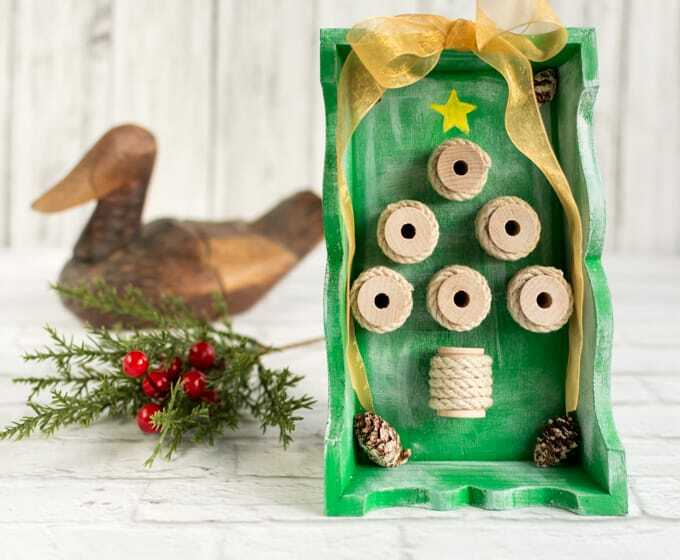 You can, of course, customize this project with whatever size thread spool, colors of paint, and additional decorations you’d like. You could use washi tape or fabric instead of twine, for example, add sprigs of artificial greenery, or go with a more rustic-looking bow. However you choose to make it, I hope you enjoy this tutorial! Yes, as usual, the light was uncooperative and varied between full on afternoon sun and pouring down rain while I was photographing this project! I apologize for any odd shadows in the photos. 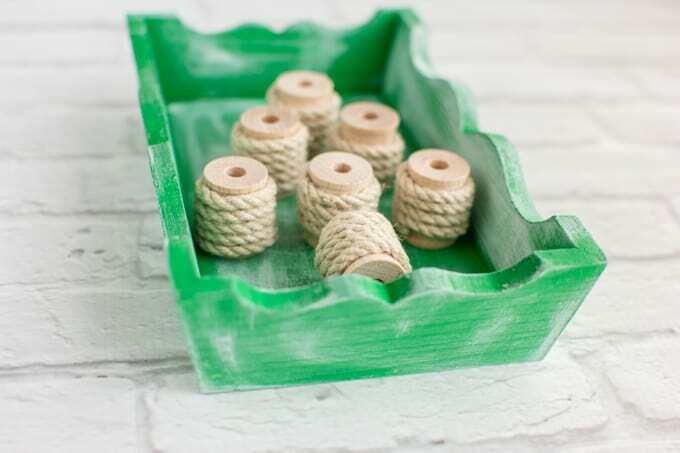 Before you even get started, play around with your wood spools in the tray to ensure they fit and you’re happy with the spacing. 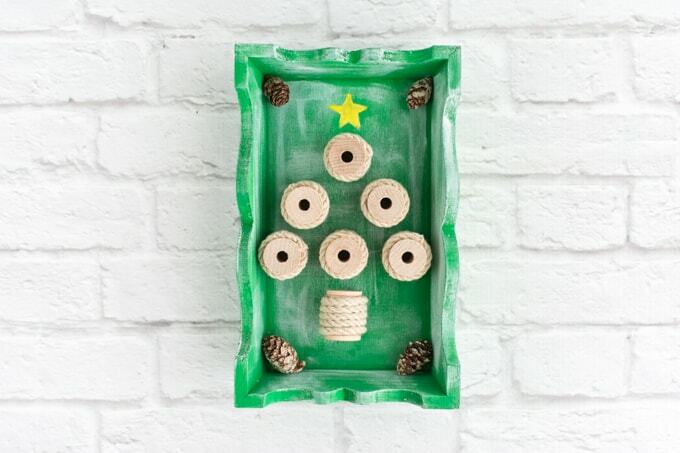 There’s no use in painting the tray and getting the spools decorated if your tree won’t fit in the box you’ve chosen! 1. 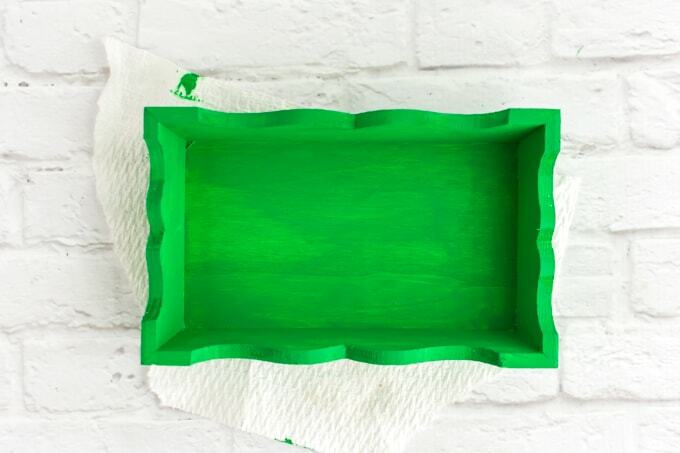 Apply a thick coat of your primary paint color to the tray or shadow box, making sure to get in the cracks and corners. and then glued a strand in place around each spool. 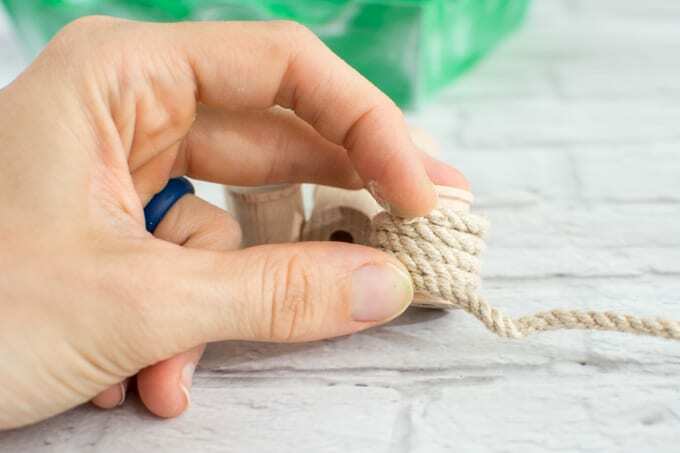 If you want to decorate your spools with fabric, you can see the technique in my thread spool bracelet tutorial! 3. 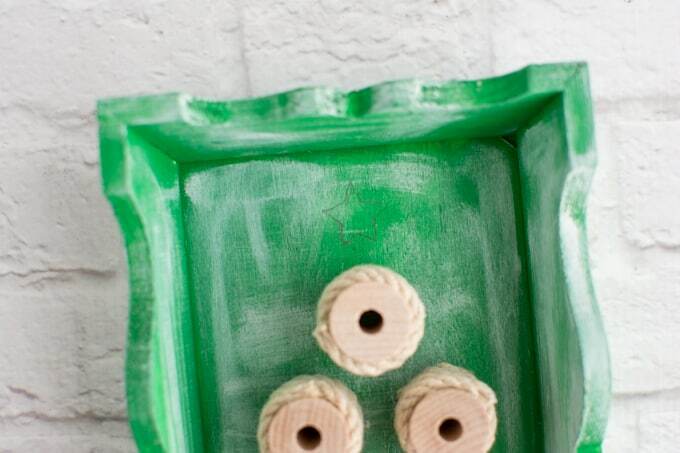 Once your first layer of paint is dry, get out your accent color, if you’re using one. I used white to give the tray an antiqued/distressed appearance. 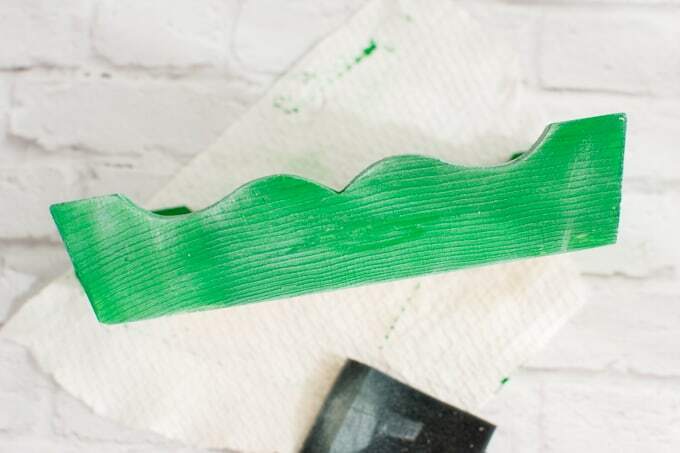 To achieve this look, you need to “dry brush.” Get some paint on your foam brush, then wipe a lot of it off on a paper towel. 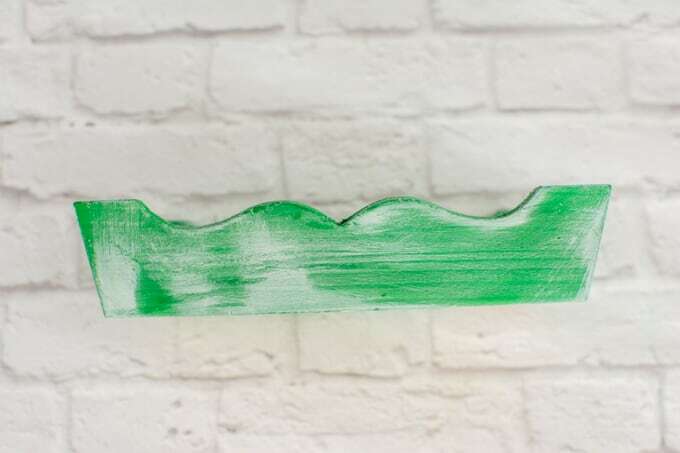 Paint with the mostly dry brush and stroke across the grain, not with it, so the paint catches on the raised areas. If you get too little paint on the first pass, you can always add more! 4. Once this second coat of paint is dry (which shouldn’t be long, since it was a light application) it’s time to assemble you tree! 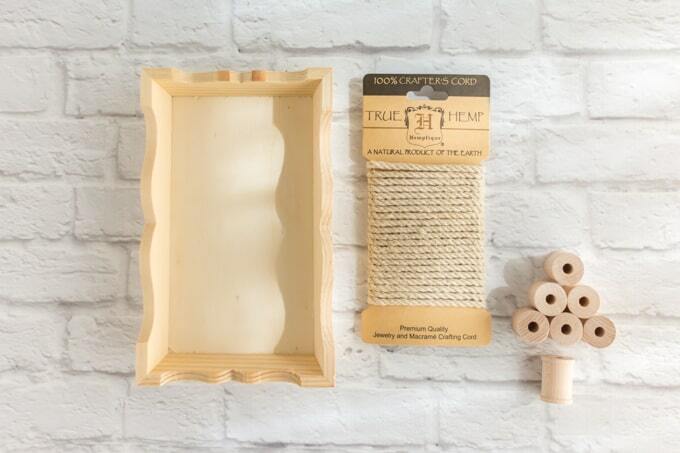 Before even heating up your glue gun, figure out where you want the spools to be. 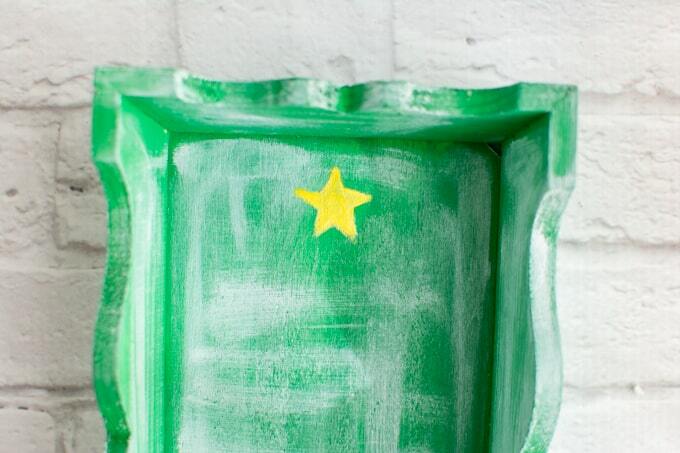 Then removed the spools so they wouldn’t be in the way and painted the star. Yellow paint has poor coverage over other colors, so I painted the star white first and then added yellow over the white. I actually didn’t wait for the white to fully dry so the two colors would mix a bit and add to the rustic feel. 6. 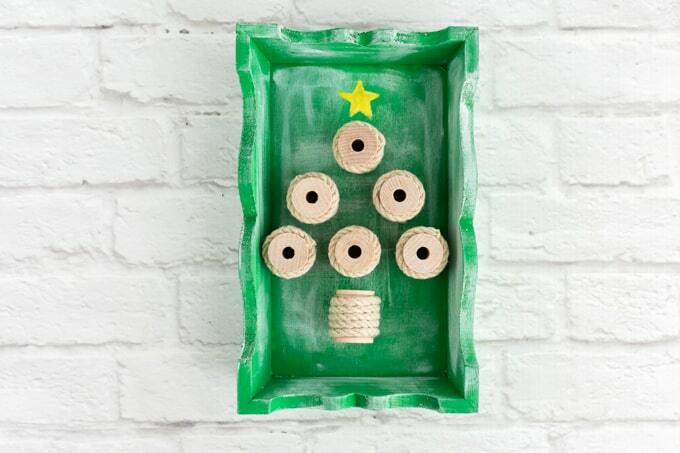 Once your tree topper is finished, fire up your hot glue gun and glue those thread spools down! and a gold bow on top. And there you have it! 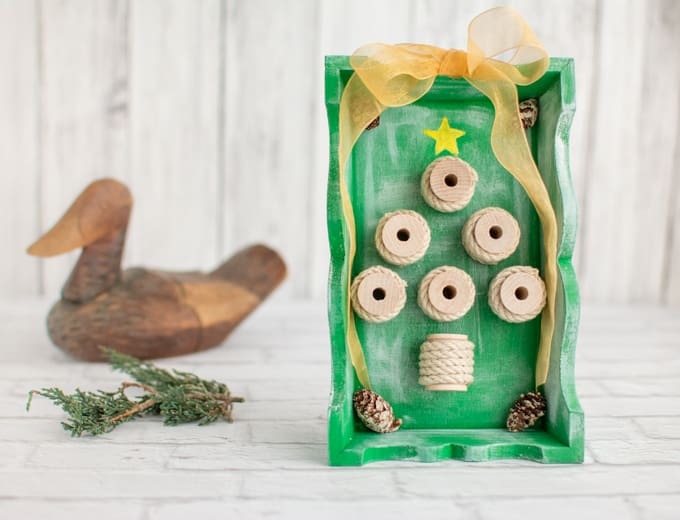 Your thread spool Christmas tree shadow box is ready to display! I have to admit that, looking at it now, I kind of want to make another one that’s beachy. Don’t be surprised if you see a variant of this project on my blog one day! How are your holiday decorations looking? Are you going all out or taking a more minimalist approach this year? My mom actually just has a basket of spools as a decoration! They’re very large, antique spools from an old mill, but it’s a basket of spools, nonetheless. This is so sweet! I never decorate my flat cos I always go home, this year, no different, but am really tempted to anyway…! It’s so nice you’re able to go home for Christmas! This will be our third ‘away from home’ and I know family wishes we could visit.